When EdgeHD first came out it caused a lot of commotion - but one complaint I remember in particular was that it had such a large field that you would need to spend a ton on a camera (at the time) to make use of it. This amused me because for some reason people want costs to be matched in components - rather than look at the cost of the overall system to achieve a certain goal. If one of the parts in the system is "wasted" on others - that is perfectly fine with me if that part just happens to be very inexpensive and the other components dominate the budget. At the same time, it would *not* make sense to spend a ton on something that is limited by other components of the system. I find a related scenario with low cost, high QE and inexpensive CMOS cameras that are available these days. There is a sense those pixels are "bad" because they aren't "matched" in some optimal sense. But it is easy to show this argument makes no sense at all - because in order to do a proper comparison you need to look at how the noise terms behave. And you need to keep in mind that you can always bin the pixels to make a new camera that is 2x or 3x the pixel size. Much of this concern for "over sampling" and the resulting noise you will suffer I think dates from early CCD days when read noise was much higher. 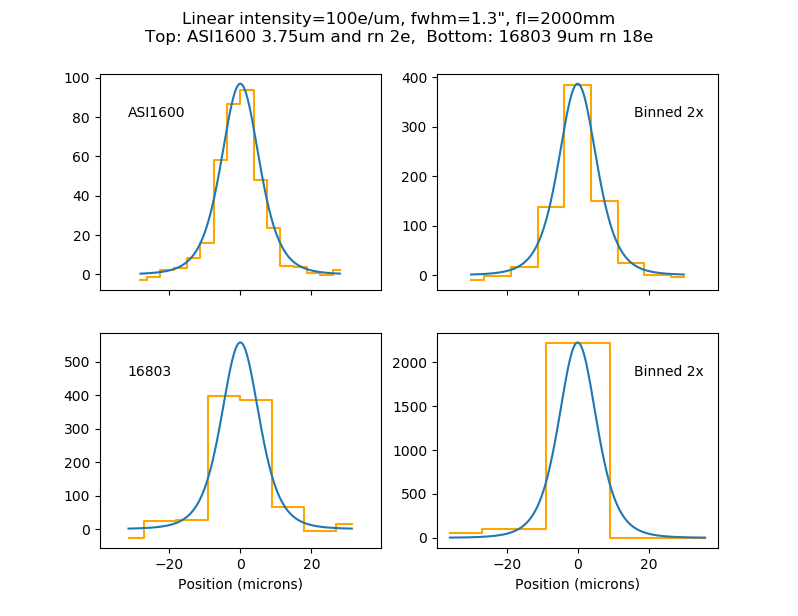 So here I am comparing an ASI1600 with 16803, which is 3.75um and 2e vs. 9um and 18e (the latter from http://www.astrosurf...oise/result.htm ). You can quibble over what the exact noise terms are - but the point is that they do matter in terms of realized performance. You can't just say "bigger pixels collect more light" and leave it at that. And here I ignore the 0.66 vs. 0.44 QE advantage of the 1600. For the comparison I take a 2000mm fl system and image a "ridge" of light - so it is like a ripple in a rug - and look at cross-sections through it as I change brightness and fwhm. By looking at a ridge I keep everything 1D so I can plot it. This is a perfectly reasonable scenario where you are imaging a faint tendril of nebulosity. In that graph you can see there is plenty of light so that the first plot is very smooth and follows the underlying curve very well. If you are just making images and looking at the pixels - and you aren't smoothing - then a good figure of merit is how much the square edged plot of the pixels tracks the actual feature shape landing on the sensor. In this case the first plot easily wins and for this feature the other plots are worse in that regard. Edited by freestar8n, 19 March 2019 - 05:28 AM. Now we can see some shot noise showing in the upper plots - and read noise is starting to show in the lower ones. But I would still choose the upper plots over the lower - though I might choose the binned 1600 over unbinned. You can always compare binned to unbinned after capturing the data. You don't need to choose to bin during acquisition like the old days. Edited by freestar8n, 19 March 2019 - 05:29 AM. The unbinned 1600 is now quite noisy, but the binned asi1600 looks good. Meanwhile the counts in the 16803 are becoming swamped by read noise and you can barely see anything even binned. In this case I would choose the 1600 binned. Edited by freestar8n, 19 March 2019 - 05:30 AM. If we go back to intensity 100 but this time with fwhm=4", then the 1600 is again looking oversampled - but at the same time the 16803 has a fairly coarse sampling of the profile. Again I would lean toward binned 1600. It has a tighter match to the true profile. Edited by freestar8n, 19 March 2019 - 05:31 AM. Finally if I keep the intensity at 100 but allow the fwhm to correspond to good seeing that I sometimes get - around 1.3" - then the small pixels have a huge win. A big factor is that the fwhm puts more light into fewer pixels and the shot noise goes down. Meanwhile the 16803 is just too coarsely sampling the profile and misses valuable detail. In summary - you can't compare different setups by pixel size alone - based on how well those pixels fit in the seeing profile. You need to factor in the role of noise - and when the small pixel cameras have very low noise - they have no downside at all - since you can always bin to make them larger. 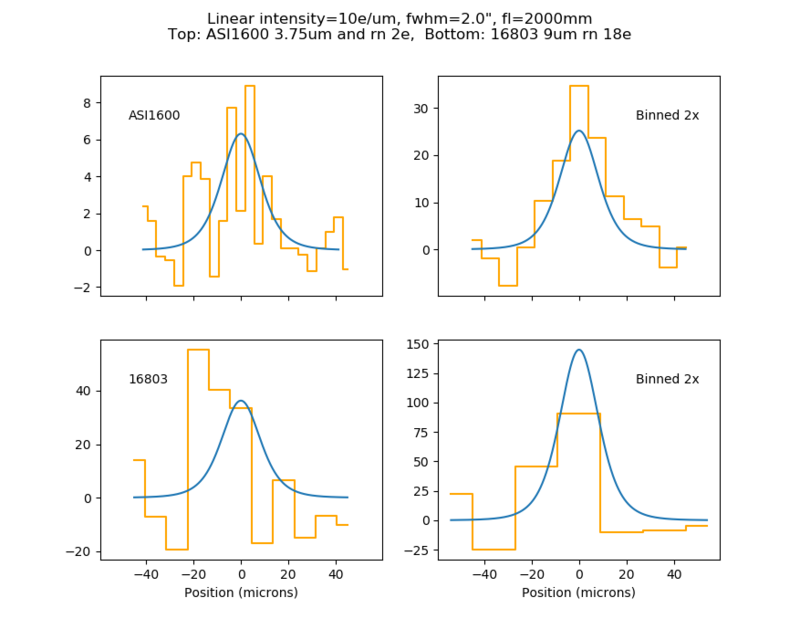 If you have a very strong signal, then the fwhm has no bearing on how finely you should sample the profile. And if the signal is very faint - it doesn't have any bearing either - because you may be better off with pixels much larger than seeing in order to overcome sensor noise. Of course in all this I am ignoring sensor size - which is a completely different issue. And I'm ignoring driver issues and challenges calibrating. And I'm not talking about post-processing or drizzling. If drizzling to bring out detail is ok - and so is smoothing - then pixel size doesn't matter at all. You can get more detail - and more noise - by drizzling; or less detail and less noise by smoothing. I'm just talking about the concrete situation of unbinned and binned raw images - since that's all that's needed to drive the "small pixels are noisy" claims. Woops - need to redo the plots. Will update in a bit. Edited by freestar8n, 19 March 2019 - 05:34 AM. Thanks for this. I think in pictures so this is very helpful for me to see the visual representation of the machinations we discuss. Thanks Ezwheels and Bennevis. In my case I have one of the very early asi1600's and I don't have a problem with drivers or calibration - and I haven't seen a freezing issue but where I am now doesn't get very cold. The main points here are very simple: If you want to capture detail well and you have enough light - you will have benefit from very small pixels to capture the profiles of the features well. And if you have very little light and an object with not much detail, there is reason to use pixels much larger than what the optics and seeing can deliver. You have a wide range over which to exchange detail for pixel SNR - and at some point the underlying profile will have an optimal match to the staircase approximation by the pixels when you actually look at the image. That "optimum" will depend on the object, the sensor noise, what is desired to be revealed in the object - and the subjective preferences of the imager. It'll take me a while to read and digest all of that, Frank. Thanks for doing all of the work. I'm wondering, though...did the 2x2 binned plots for the 1600 take into account the lower (10-bit) readout, and that the binning is actually post-ADC? You bring up an important point I should clarify. With ccds there is motivation to bin during acquisition because you will likely get less read noise than if you image unbinned and then bin in software. But with cmos there is no motivation so you can just capture unbinned. These cameras do have less bit depth if you bin in hardware - but if you just bin in software after imaging there is no issue. The pixel area and signal, along with the effective well depth, go up by a factor of 4. And read noise goes up by a factor of two - ending up still at only about 4e for the 1600. Thanks, Frank. You did account for it -- and gave a good reason to not hardware bin with them to boot! It is still very useful to bin cmos in hardware and tolerate the reduced well depth - and that is for high frame rate video. But that doesn’t apply to deep sky. But that does explain why they do it and why it can be a good thing. I found on the PI forum how to bin but I am not clear when to bin with software. Would that be before calibration or after integration? It is probably important to point out that what Frank is referring to as "binning" for CMOS cameras is nothing more than resizing and it offers no real advantage. 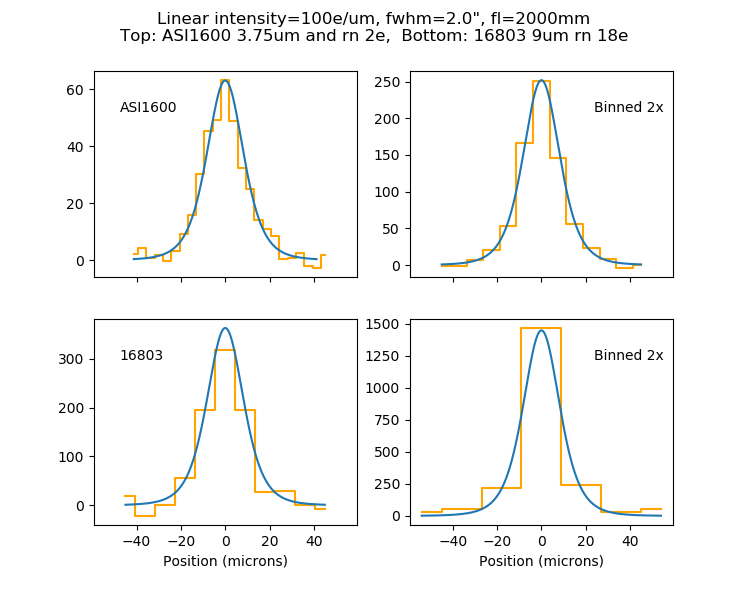 True hardware "binning" (as opposed to simple resizing) brings with it a significant read noise advantage, since in most CCD sensors, read noise is reduced significantly when binned. So you get both the advantage of a larger effective pixel and reduced read noise. My understanding is that Frank is making a case that software binning for a CMOS does offer an advantage. Let me use a real life example. My club has an 18 inch imaging newt on an equatorial fork mount, F4.5 at 2057mm focal length. I have a ZWO ASI1600MM-C and an SBIG STF8300m. Which would be the better camera to use on that scope? The SBIG with hardware 2x2 binning or the ZWO with software binning. Edited by Jeff2011, 20 March 2019 - 09:15 AM. With due respect, I don't understand how so many people say "no advantage" to CMOS binning. 2x2 binned CMOS SNR = 4T/sqrt(4T+4S+4R) = 2xSNR -- 4x the speed. I wasn't clear. I meant that binning in CMOS cameras offers no advantage over simple resizing in post processing. In fact, it offers a significant disadvantage - at least for the Panasonic sensors - in that the the bit depth is dramatically reduced. Yes, you can double the SNR, but simple resizing does the same thing and in fact is essentially the same thing. The only real advantage that in-camera binning offers for CMOS cameras is a fairly dramatic increase in readout speed. True hardware binning on the other hand, quadruples the SNR (assuming 2x2 binning - same read noise as one pixel but 4 times the signal) and offers a true and significant advantage over simple resizing. I hope that makes things clearer. I wouldn't say "significant advantage over simple resizing." 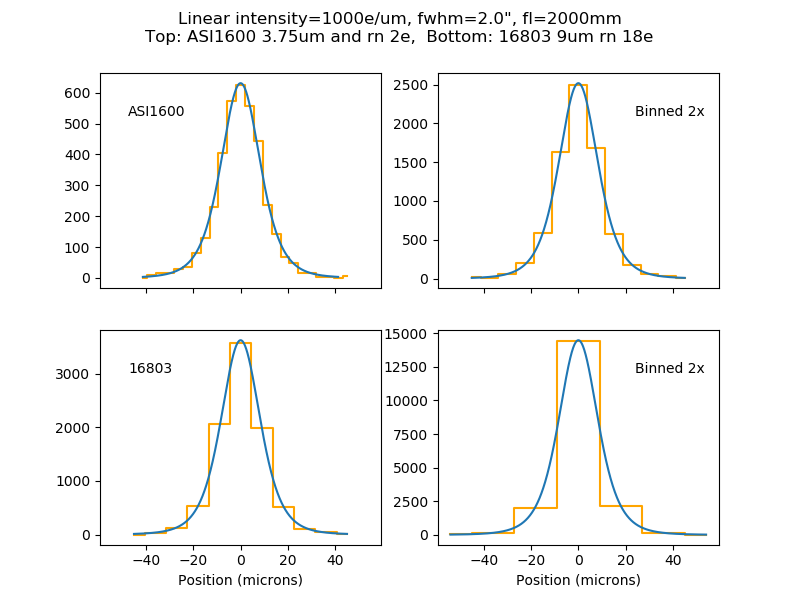 Compared to CCD, CMOS 2x2 binning you get 4 read noise hits. CMOS read noise is pretty low to begin with. At 200 gain for the ASI-1600 (unity 139) I suspect even 4x read noise is still about 1x CCD read noise. For CMOS 2x2 bin you always get 2xSNR, 4x speed. This is significant. With CCD's you get an additional SNR boost because only 1x read noise added. You're being needlessly argumentative. Please read what I said. You even quoted the relevant part. I said that hardware binning has a significant advantage over simple resizing. That's all. 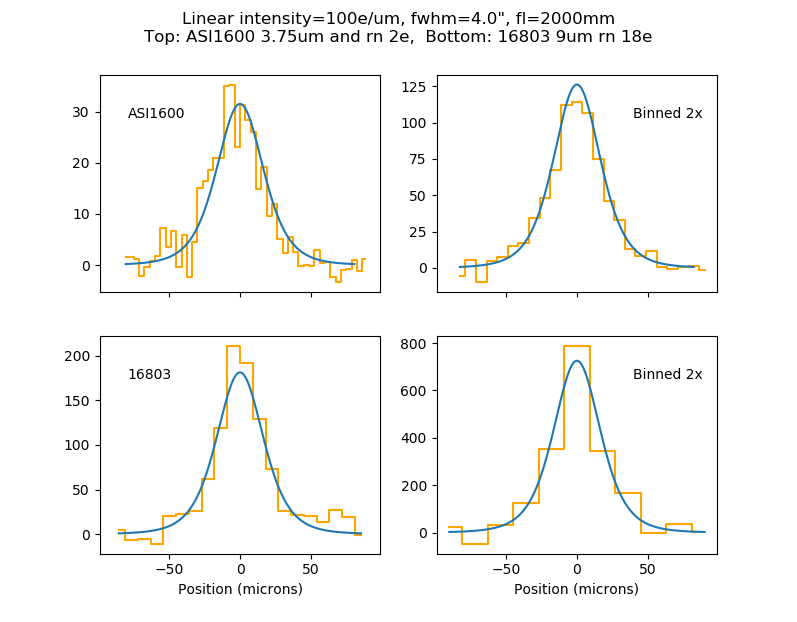 I was not comparing CMOS and CCD sensors. I'm just trying (apparently unsuccessfully) to point out that there is a significant difference between true hardware binning and resizing, regardless of the camera. And that, with true charge binning in a CCD, the benefits may well outweigh the sampling cost that Frank is talking about. Whilst the stats presented are very useful for analytical value in reality most people will just stick with what currently works for them. It is sad that imaging time, notably for me, is now so precious that I have little time to experiment so will mostly image at settings that I know produce reasonable results and leave it at that. However you've done a great job at presenting the facts. My main point in specifically talking about 'binning' is that any camera you have can be treated as two cameras - one with pixel size S and read noise R - and another with pixel size 2S and read noise 2R. For the asi1600 that is about 3.75 and 2, plus 7.5 and 4. It makes no sense just to talk about a camera as being inherently stuck at the parameters of its smallest pixel when you can bin and make the effective pixel larger - and possibly end up with much better performance than another camera with larger pixels, but higher read noise. You can go ahead and capture all frames unbinned and then stack the result - and then bin it. Or you can calibrate each frame - then bin them - then stack them. You can even go ahead and bin all raw sub exposures - and calibrate them with binned masters - and all this stuff will apply. It is no different from working with a larger pixel camera with a bit more read noise. By binning you do indeed get a boost in SNR - because the signal goes up by x4 but all the noise terms in the pixels go up by x2. But at the same time, this is no different from simply resizing the final image - as long as it does some kind of interpolation on the result. It's just that conceptually that doesn't make it clear how a single camera can act like one with 2x or 3x sized pixels - and provide a win. But whether you bin or low pass or resize with interpolation - you are always getting an SNR benefit when you merge the information from several pixels into 1. And if you really need a big boost in SNR - you can go ahead and bin or smooth on a much larger scale than whatever seeing is for you. There is no need to use seeing as a lower or upper limit on how you should sample.